The Locker is a head turning new design from Black Rhino. It is a strong composition of milled bold spoke styling with a deep aggressive lip. The bolts visually lock down the seven chamfered spokes giving this combination a truly tough personality of style and ruggedness. The Locker design’s deep lip adds a brawny stance reminiscent of race bred machines. The Locker’s 2700 lb. load capacity (per wheel) is burly enough for heaviest of Sprinter builds. These wheels will certainly widen your vehicle’s track with 52 mm of offset. They’re also compatible with our 14 mm hub-centric wheel spacers. Good news for those of you looking to give your rig an even more aggressive stance. These wheels measure 17×8 inches and feature a gloss black finish. Fit Notes: Requires longer aftermarket lug bolts (not included). Wheel spacers are required for clearance on vehicles with modified suspension systems (ex. Agile RIP Kit). Interested in a wheel & tire combo?? 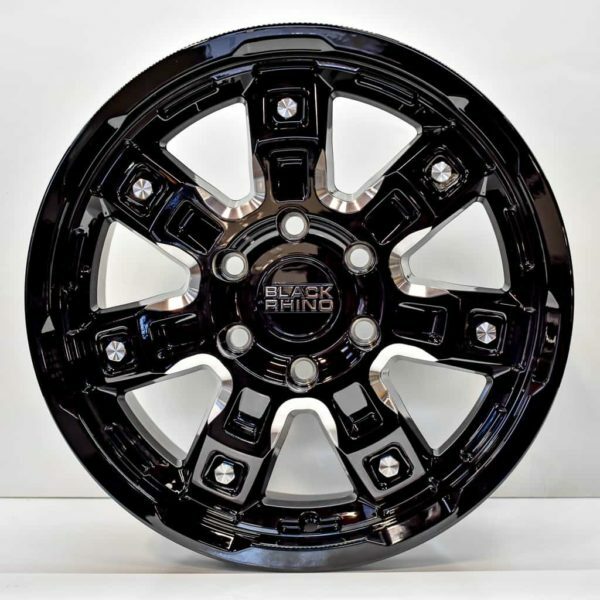 We’ll ship these wheels to you wrapped in a set of BFGoodrich All-Terrain KO2’s. Contact us for details!